Why using ArnoBrik Series Briquetting Presses? In contrast to loose swarf, briquettes offer huge cost savings. Because briquettes emit virtually no fluids, simpler and smaller deposit sites can be used. Based on three different filling variants (according to the free flowing property of the material) the ArnoBrik Series Briquetting Presses can compress a wide range of different raw materials: steel, cast iron, stainless steel, aluminium, magnesium, brass, copper, bronze, titanium, special alloys in powder form, slag compounds, battery waste and grinding slurry from a wide variety of materials, as well as tyre wires and mill scales. It's possible to form mixed briquettes of diverse materials too. 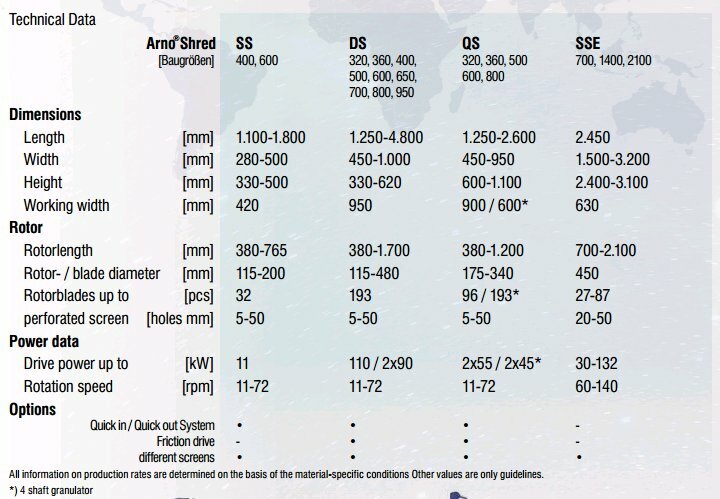 Arno®Shred SS for chip size reduction. Our single shaft shredders guarantee trouble-free operation through reliable technology. The provenSS-series are high performance machines fromsingle-shaft shredders, which are primarily usedfor crushing metal chips. 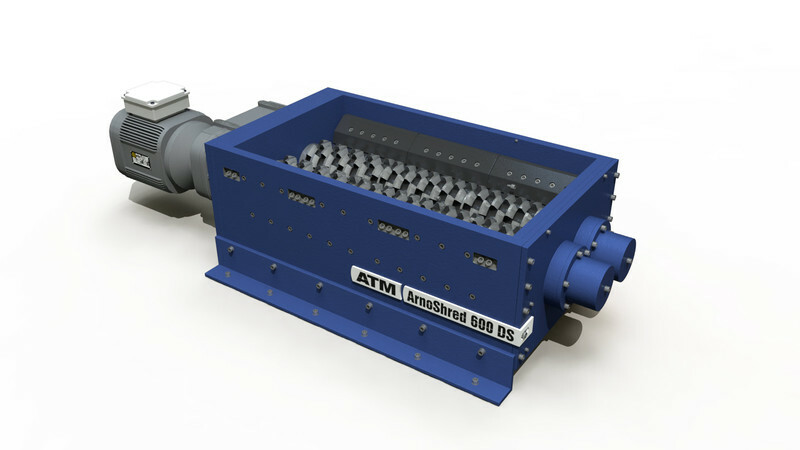 Through continuousdevelopment, in cooperation with industry andcommerce, Arno®Shred SS series was created. 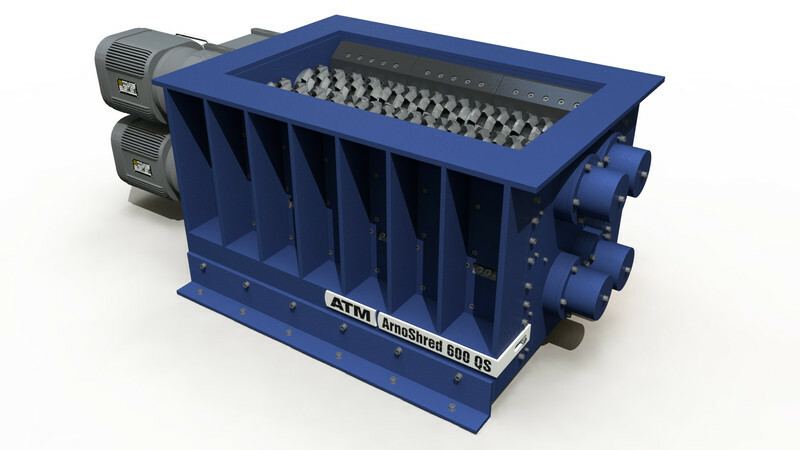 Our single shaft shredders are modular configurableand can be matched with material-specificoptimised cutting discs for your material. Our knives are available in different materials and hardness as well as in hard metal. Depending on the application, we also deliver wear plates in high compensated quality or food safe quality. To optimize performance, auxiliary devices such aspressing paddles, feed and discharge conveyor and extraction systems, can be supplied. Our systems can have monitored technology integrated into production lines via modem / VPN and have aPLC-controlled reversing and automatic shut-off. SThe innovating feature is the tramp metal discharge opening. All lump parts are ejected during the shredding process to protect the tool and increase it‘s lifetime. Additionally a friction clutch protects the drive mechanism against overload. Thereby the ArnoShred resists extreme conditions on scrap yards. Depending on the purpose of the shredder we offer wearplates in various material qualities. For every material that you have to shred, we deliver the proper knife. Our machines are equipped with a friction clutch to avoid damages with the axle. If needed, hard metal pieces can be ejected into a separate container, to guarantee clean material for the following processes. All the cyclinders (feed and material ejection) can be driven by hydraulic or pneumatic devices. For optimal distribution to the shaft, there are up to 3 feeders. Due to the patented extraneous material ejection and the friction clutch less energy for cutting is needed. The powerful and efficient rotary shear - a doubleshaft shredder - is often used in the pre-crushingof metal, tires, e-waste or plastic. The cuttingdiscs shred the input material in the longitudinaldirection. With additional fitted transverse blades,the material is crushed to defined piece sizes. With special granulator blades and screen baskets, the double shaft shredder can also be used for fine crushing. For high throughput rates withchips shredding the ArnoShred DS is also executed with double rotor and both-sided stator blades. Quick in - quick out! Our quick-change system reduces enormously the downtime when changing the blade. About 80 blade geometries with 12 different diameters and different knife widths are available. The technology of our shredder is based on more than30 years experience with several hundred plants supplied from Industrie Service Drüge. To optimize performance, auxiliary devices such as pressing paddles, feed and discharge conveyor and extraction systems, can be supplied. Our systems can have monitored technology integrated into production lines via modem / VPN and have a PLC-controlled reversing and automatic shut-off. Arno®Shred for shredding various materials. 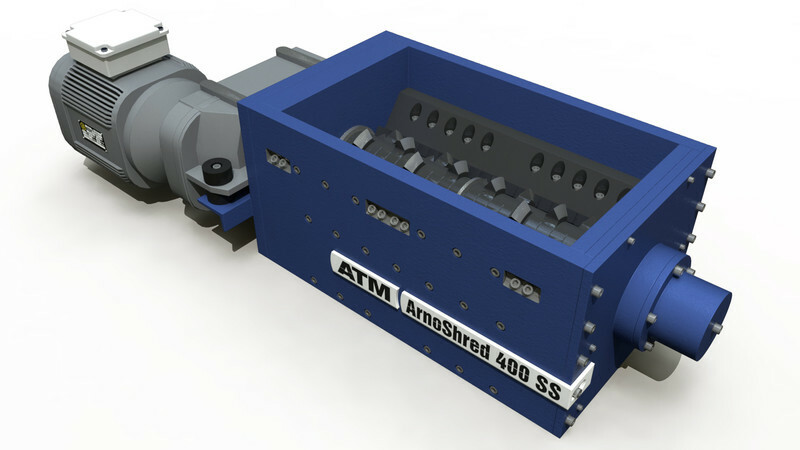 Due to the solid construction, the high-performance and robust cutting unit the ArnoShred QS four-shaft shredder is suitable for continuous operation. Depending on the material and bulk density, different blade geometries (eg rip hook or pelletizing function) are used. In this way precisely defined particle sizes can be crushed and also bulky material can be crushed efficiently. A combination of rotary shear and four-shaft shredding ensures maximum process reliability and economical operation.